One month after the superb DIMECCE conference in St Andrews, I had the very welcome opportunity to meet the DIMECCE team again at the LSE (London School of Economics and Political Science) Middle East Centre. 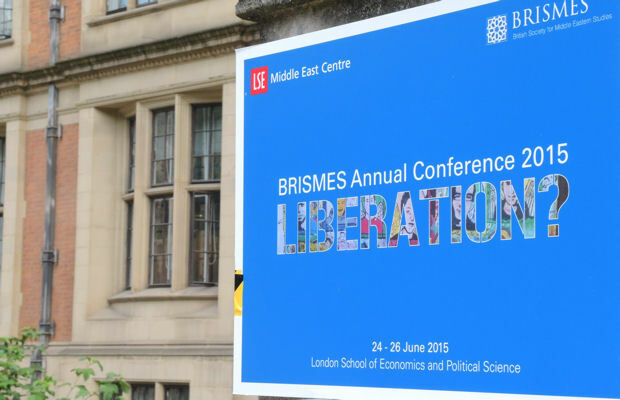 I gladly accepted the invitation to participate in a panel on Middle Eastern Christian Diasporas at the annual Conference of the British Society of Middle Eastern Studies (BRISMES) with a paper from my current research on Austrian Diasporas that would fit under the general theme of ‘Liberation’. The panel also included Heidi Armbruster, an anthropologist at the University of Southampton and long-time researcher of Syriac communities, thus the DIMECCE-organised panel turned out to be a very strong and homogenous package of five presentations – three DIMECCE papers on their case studies (Fiona McCallum on the UK, Marta Wozniak on Sweden, Lise Paulsen Galal & Sara Lei Sparre on Denmark) and the two external contributions. Our panel was scheduled for day three of the conference, so before reflecting more on that, I better start at the beginning and try to recollect my BRISMES experience from June 23 to 26, 2015. The conference which had more than 220 participants opened with a plenary session on the current Middle East since the Arab Spring in 2011. Peter Sluglett, renowned for his work on 19th and 20th century Iraq and Bilad al-Sham, gave some interesting historical perspectives on the issue of political change in the region which has become a topic of much speculation since the Arab Spring revolutions, counter-revolutions, conflicts and wars. The following three days contained in total 51 panels which represented a wide variety of subjects, methods and approaches in studying the Middle East. Not coming from the Middle Eastern Studies myself and having joined the sub-field of Middle Eastern Christians only recently, I benefitted from the opportunity to gain some insights on regions that are relevant for my current study of Syriac and Coptic Christians in order to broaden my background knowledge. My personal highlights were two panels on the morning of the second day. Unfortunately, they were taking place simultaneously, so I tried to get the best of both by switching from one panel to another. The first was entitled ‘The Arab Spring to Arab Winter: Explaining the limits of post-uprising democratisation’ and started with Professor Raymond Hinnebusch of the University of St Andrews. Having read his book ‘Syria: Revolution from above’, I had high expectations of his analysis of different paths that countries have taken after the uprisings – and I was not disappointed! Hinnebusch somehow miraculously explained in a nutshell the events in the different case studies such as Yemen, Tunisia, Egypt or Syria and put forward a framework that allowed an understanding of why things proceeded differently in each of the cases. The parallel panel dealt with ‘domestic perspectives on the Syrian uprising’ and as was the case with the previous panel, was dominated by panelists from the University of St Andrews. From what I remember, all four papers were based on dissertation projects which all appear to be fascinating. Ferdinand Arslanian analyzed the case of left-wing Syrian opposition activists who were very skeptical about the uprising from the beginning. Tamara Al-Om focused on the development of the Syrian civil society through non-violent movements created at the beginning of the uprising. Dara Conduit drew parallels between the unrest in Hama 1980-82 and the city of Homs in 2011 and argued that despite many differences in these two cases the ‘root causes of grievance were remarkably similar.’ Finally, Daria Vorobyeva presented her study on the Armenian Christians of Syria who since the uprising have left for Armenia. Beside our own panel, this was the only paper in the whole conference which focused on Middle Eastern Christians, which demonstrates once again that the subject is far from being studied extensively in the field of area studies. The DIMECCE-organised panel addressed the challenges of liberation faced by Middle Eastern Christians after they migrate to Europe and how this is reflected in personal and in-group negotiations of identity. Heidi gave a concise synthesis of her multi-sited ethnographic research on Syriac communities. Instead of commenting on that, I strongly recommend reading her monograph ‘Keeping the faith’ which was a really important resource for me when I started working in this field two years ago. With regard to Middle Eastern Christians in the UK, Fiona analysed that their experience of secularism and declining religiosity might result in a general discourse about Christianity and/or religion and the societal role of religion. Marta examined the current visions of diaspora Assyrians/Syriacs in Sweden have regarding return to their homeland and provided us with an impressive overview of her research findings such as plans to create a free Assyria in the Middle East. 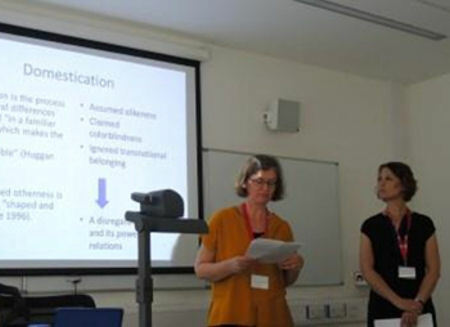 What amazed me about Sara and Lise’s paper on Iraqi Christians in Denmark was their proposal to contextualise narratives of Islam as a threat that frequently came up in interviews by connecting them with resistance against experiences of domestication and minoritisation in the receiving country. I’m looking forward to reading more about that in the published paper. In my presentation, I looked at some interviews I’ve conducted with Syrian Christian refugees who arrived in Vienna in late 2013 arguing that aspects of disruption are manifest in all of the life stories I have collected. Overall, I can frankly say that I very much admired our panel! It provided a lot of information from our research projects and it was inspiring for me to share insights and ‘fresh’ results once more, I’m lucky to add after attending the DIMECCE conference in St Andrews and the workshop in Lodz. The opportunity to share project findings and network is very important for a one-person-project like mine! I also felt that my DIMECCE colleagues were significantly less stressed compared to the previous meetings which were organized by them, which left lots of time for discussions apart from our panel throughout the whole conference. I would also like to thank Fiona for having the idea of organizing a DIMECCE dinner which I was also invited to where it was a pleasure to meet Frédéric Volpi and Anthony O’Mahony, DIMECCE Advisory Board members. Embarrassingly enough I had never been to London before, and even more embarrassingly, after my four day visit for BRISMES, I have not seen much of the city other than the LSE, two restaurants and Heathrow airport! This underlines that the BRISMES conference was both full and attractive and could compete with the attractions of London I had read about in my guide book. Well, London, maybe see you next time!